The Liberty Horn is a Revolutionary War style horn. It is made of cow horn with a cherry plug and stopper. The scrimshaw expresses "Liberty" sentiments. Note the Colonial soldier with the Hessian prisoner. Below are samples from our portfolio. 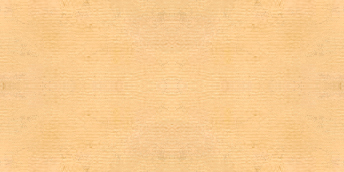 Click an image to see more detail. The horns above demonstrate some of the hundreds of possibilities in design and style for a powder horn. The award winning Scott Lance pistol charger on the left is an eight faceted flat horn in the Scottish manner. It had a fruit-wood plug with a turned horn spout and cherry stopper. The Whitman horn is a presentation horn made for the Governor of New Jersey. This is a horn that is engrailled. It is engraved with New Jersey State emblems and has a fruit-wood plug with a brass finial. The Liberty horn as seen from the opposite side is as above. Here you can see the word "Liberty" commemorating the Revolutionary War. Page's horn is an example of a horn where the owner chose motifs that were meaningful to her. The design is executed in the manner of the 18th century. Page's horn is an example of a lobed horn that has been engrailled as well as engraved. 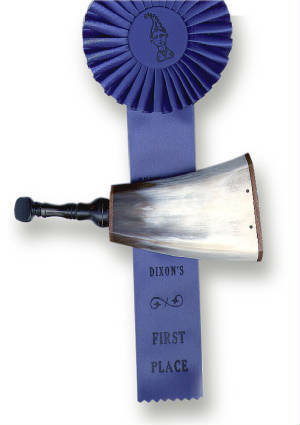 The last horn is a fine example of an undecorated horn of the French and Indian War period. The beauty of this horn is the architecture and curve of the structure. It illustrates how the beauty of the horn itself is all that is necessary to complete an object that is pleasing to the eye. All the horns above are hand worked cow horn. The variation in color of the horns is due to the differences in color of horn itself and in some cases the horns are dyed in the same manner as the originals were. 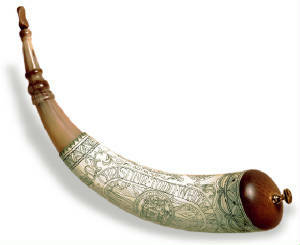 All engraved horns are decorated with the art form known as scrimshaw. Some horns are engrailled which is a process of carving the horn into pleasing designs and in some cases is part of the completed architecture of the piece.